Editors: Kim H. Esbensen and Claas Wagner. What is the meaning of analysing any sample if it cannot be documented to be representative? The answer is “none”, and that is the reason for this column. Starting with the Theory of Sampling, it builds into a valuable resource covering the theory and practice of representative sampling. Read more about the Column Editors. This is the first of a number of columns dealing with process sampling, i.e. sampling from moving streams of matter. As will become clear there is a great deal of redundancy regarding how to sample both stationary and moving lots, but it is the specific issues pertaining to dynamic lots that will be highlighted. Kim Esbensen and Claas Wagner have produced an extensive Sampling column, on “Representative mass reduction in the laboratory: riffle splitting galore (with or without errors)”. They guide readers through the choice of mass reduction equipment and what needs to be done to ensure representative sampling. Kim Esbensen and Claas Wagner continue to stress that grab sampling is still an absolute no-no regardless of the size of the sampling device or the sample. This column now turns its attention to sampling using a very popular tool, the “sampling spear”. There is much good to be said about spear sampling—and only one thing which is bad. But this is bad enough: spear samplers are very, very difficult to get to produce representative samples! The spear sampling principle can be made representative, but in most practical situations in which spear sampling is used today it manifestly is not. WHY? And more importantly, WHAT can be done about it? This column also turns out to touch on one of TOS’ six governing principles: SSI, Sampling Scale Invariance. 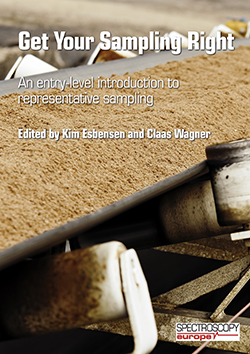 In their Sampling Column, Kim Esbensen and Claas Wagner stray into Quality Matters territory as they look at standards and how they work with the Theory of Sampling. Kim and Claas are concerned that many international standards do not comply with the TOS and that this compromises the results. Another side of ensuring that our results are valid is correct sampling. In the latest Sampling Column on “Sampling quality criteria (SQC)” Kim Esbensen and Claas Wagner continue our education in the use of the Theory of Sampling. The fundamental step in ensuring representative sampling is sampling quality criteria, and the authors describe why and how. In the Sampling Column, Kim Esbensen and Claas Wagner continue our education about representative sampling. In “Sampling quality assessment: the replication experiment”, they provide an overview of the issue of replication, which may not be as straightforward as might be expected at first. Kim Esbensen and Claas Wagner’s Sampling Column also addresses issues around ensuring valid results, from the sampling perspective. “Composite sampling II: lot dimensionality transformation” continues to address the problem of heterogeneity and how to overcome it. If you can find a time when your bulk (3D) sample becomes a 1D sample, the job is possible. Interesting examples from unloading a grain ship to emptying a fishing boat hold are described. Kim Esbensen and Claas Wagner tackle the problem of heterogeneity in sampling and show how it can be dealt with at the primary sampling stage by “Composite sampling I: the Fundamental Sampling Principle”. As well as explaining the theory they also introduce practical solutions. Kim Esbensen and Claas Wagner tackle the problem of heterogeneity in sampling and show how it can be dealt with at the primary sampling stage by “Composite sampling I: the Fundamental Sampling Principle”. As well as explaining the theory they also introduce practical solutions.